Tufts University biologists have demonstrated for the first time that electrical patterns in the developing embryo can be predicted, mapped, and manipulated to prevent defects caused by harmful substances such as nicotine. The research, published today in Nature Communications, suggests that targeting bioelectric states may be a new treatment modality for regenerative repair in brain development and disease, and that computational methods can be used to find effective repair strategies. In a developing embryo, the outer membrane of each cell contains protein channels that transport negative and positive ions, generating voltage gradients across the cell wall. Groups of cells create patterns of membrane voltage that precede and control the expression of genes and the morphological changes occurring over the course of development. "Studies focusing on gene expression, growth factors, and molecular pathways have provided us with a better but still incomplete understanding of how cells arrange themselves into complex organ systems in a growing embryo," said Professor Michael Levin, Ph.D., corresponding author of the study and director of the Allen Discovery Center at Tufts University. "We are now beginning to see how electrical patterns in the embryo are guiding large scale patterns of tissues, organs, and limbs. If we can decode this electrical communication between cells, then we might be able to use it to normalize development or support regeneration in the treatment of disease or injury." To help decipher that code, Levin and lead author Vaibhav Pai, Ph.D., a Research Scientist II at the Allen Discovery Center at Tufts, explored whether it was possible to use a computational model to predict the bioelectrical patterns that occur in normal and nicotine-exposed embryos, and then use the model to identify reagents that might restore the normal pattern even in the presence of the teratogen (a class of molecules that induce birth defects). In humans, nicotine has been linked to prenatal morbidity, sudden infant death, attention deficit hypersensitivity disorder (ADHD), and other deficits in cognitive function, learning, and memory. Earlier studies suggested that these defects may be a result of nicotine depolarizing cells in the embryo by inducing acetylcholine receptors to pump in positively charged sodium and potassium ions. Levin and Pai hypothesized that disruption of the normal bioelectric prepattern that drives brain patterning could be the underlying cause for these defects, and that restoring this pattern might rescue those defects. Pai worked with Alexis Pietak, Ph.D., a primary investigator at the Allen Discovery Center at Tufts, who developed a powerful computational simulation platform - called the BioElectric Tissue Simulation Engine (BETSE) - to create a dynamic map of voltage signatures in a developing frog embryo. The simulation engine (available for free download) was built on a biologically realistic model of ion concentrations and fluxes and parameters of ion channel behaviors derived from molecular studies. The BETSE model accurately replicated the distinct pattern of membrane voltage from the normal embryonic brain development, and also explained the "flattened" (erased) electrical pattern observed to result from nicotine exposure. 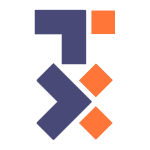 The Tufts researchers were then able to use BETSE to explore the effect of various reagents on the embryo's voltage map. One reagent in particular, the hyperpolarization-activated cyclic nucleotide gated channel (HCN2), when added to the cells in the model, selectively enhanced hyperpolarization (large internal negative charge) in areas where it was diminished by nicotine. The effect—akin to dialing up the contrast in a photo editor—effectively restored the normal electrical pattern. 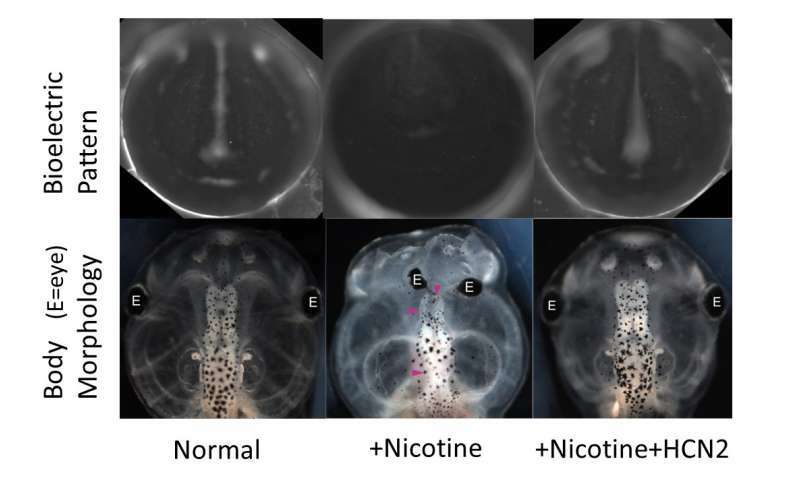 Remarkably, expressing HCN2 in live embryos rescued them from the effects of nicotine, restoring a normal bio-electric pattern, brain morphology, markers of gene expression, and near normal learning capacity in the grown tadpole. "This is an important step providing a realistic model that bridges the molecular, cellular, bio-electrical, and anatomical scales of the developing embryo. Adding the bioelectrical component was critical to making a search for therapeutic strategies more tractable," said Levin, the Vannevar Bush professor of biology in the School of Arts & Sciences at Tufts.